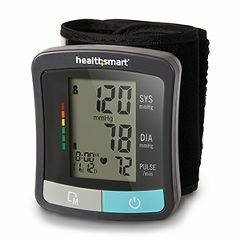 HealthSmart Standard Universal Wrist Digital Blood Pressure Monitor for managing High or Low Blood Pressure, Model 04-810-001. AllegroMedical.com is Here to Help Since 1996! The HealthSmart® Standard Series Universal Wrist Digital Blood Pressure Monitor is a wrist digital blood pressure monitor. More than two people can use the BP monitor since there is a 2-user memory storage with total of 120 reading memory storage. The date and time stamp will remind you when you took the test. It will detect irregular heart. The 3-year limited warranty will make sure it is working just right for years to come. Clinically accurate. This chic blood pressure monitor will fit into your lifestyle whether you use it at home or on the go. Stay on top of your blood pressure no matter where your day takes you. Bring it to the office or even on a trip. Healthy living, simplified! No uncertainty here – just large, easy-to-read blood pressure and heart rate numbers on digital screens. It is battery operated, so say good bye to cords that get in the way. Cuff fits 5 ¼ to 8 ½ inches. VERY HARD TO POSITION. WHEN YOU HAVE ARTITRIS. SCREEN SHOULD TURN. WHAT IT WAS MADE FOR. 69 YEAR OLD MALE. WITH ARTHRITIS. WITH CANCER. WITH HEART DISEASE. WITH DIABETES. WITH MELTI MEDICATIONS.